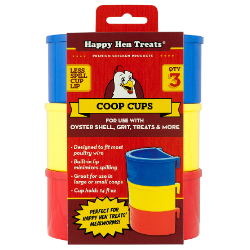 Great for oystershell, grit, treats, & more. Perfect for Mealworm Frenzy® and Party Mix varieties. Designed to fit most poultry wire. Built-in lip minimizes spilling Great for use in large or small coops. Cup holds 14 fl oz.